If you are looking for a place to stop over in Cebu Transcentral Hiway, then Haven Cafe in West 35 Eco-Mountain Resort will be a great place to dine and chill. The cold breeze and the wonderful mountain views will surely take your stress away. It’s approximately 35 kilometers from Cebu City halfway going to Balamban and takes about 45 minutes to an hour via V-hire. It was a fine day when I got there together with a few bloggers. We just came from Tsuneishi shipyard to gaze a launching ceremony (read it here) and thanks to the organizers we were treated with a sumptuous lunch. On the rooftop of the cafe is a viewing deck which gives you a picturesque 360 degree view of the mountains of Balamban. Seen from the deck also is the Villa which gets you close and intimate with nature literally because of their unique bathroom with transparent glass walls. For details on their rates for day use and overnight stay, contact or check out their Facebook page. 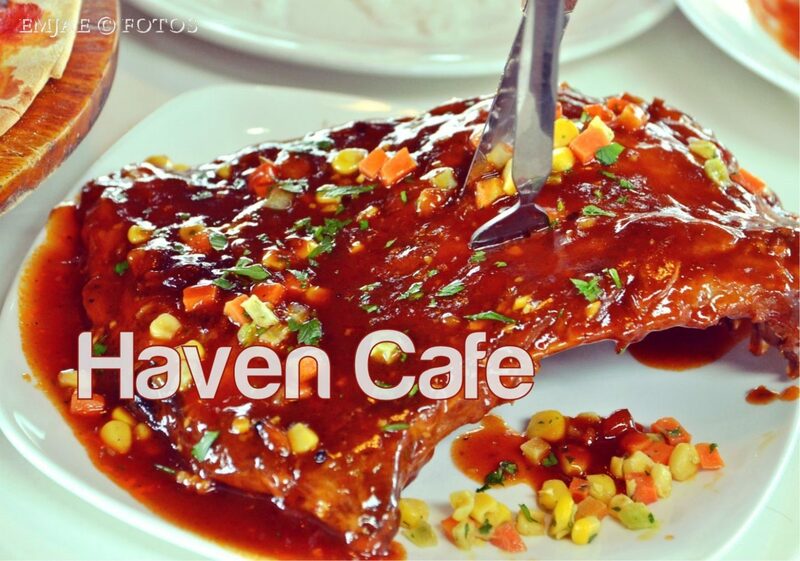 The Haven Cafe serves all-day meals from American/Italian to Filipino cuisine for a reasonable price. I was actually amazed by the fact that the place is really visited by groups of people when we got there. I mean it was a weekday and the place is on top of the mountains where you need to drive a winding road. It only say that it’s not just the food that is good but the ambiance and the surroundings as well. I was not able to take a picture of their menu as I was busy walking around. For those curious, here is a photo of their menu from a blog dated June 2012 so prices may have vary already but I think the food they serve remained the same and maybe new ones added. We had a pizza and pasta combo. Wow I was carbo-loading baby! Do you know that Haven Cafe grows its own organic vegetables which is served in the restaurant? That is really nice to know and good news for organic food lovers out there. For our drinks we had this healthy minty lemonade. It was my first time to try it and it taste really new to me but for a healthy refreshment, it is soothing. We also had some soup. It’s a good sip especially on a cool place and really helps my appetite. And for the main event, I drooled on the grilled baby back ribs. The meat was tender, the sauce was just right and it was mouthwatering in every bite. And lastly, when we thought we had enough, we still had this delicious desert. I was literally full but I would be fooling myself if I pass on this. It has a brownie cake at the bottom and my sweet tooth got awaken. I really wish I could translate everything that my taste buds received that day. It is still one of the things I am trying to work on to be a certified food blogger. I’m a certified foodie and loves food trip but I usually just rate them in 3 things: yummy, not bad and okay. This was definitely YUMMY! Well I guess I need to practice more and that means eat more. Hehehe! For now let the photos leave a taste in your mouth. It’s for me to know and for your to find out so go forth and visit this Haven on the mountains of Balamban. I cannot help but read every article you write with your own voice in my head. Especially when I recall you “what that” statement. LOL. PS: IMO while the pictures (of food) are essentially well exposed and well composed, the color treatment feels off. Save for the last picture of that yummy looking ice cream. wow! very enticing photos! i want to go there na! And here I go again stumbling into food posts in the middle of the night! I have always wanted to go to West 35 but I have a hard time convincing my mom to drive all the way up. I hope that when I show her your heavenly and sumptuous photos, they’ll convince her enough! Plus the view is breathtaking! I’ve also read about this before but I’ve never visited everrr. Hehe. I hope I have my own car! Hahaha, so that it’s easier to go around Cebu. Lol. Great views and looks like really yummy food!! Look at all those mouthwatering food! Had we been there, we would literally devour everything. hehe. The next time we head south via the transcentral highway, we’ll make sure to drop by this place. I have always wanted to go here pero kj kaau si boyfie! Rawr! The food looks so mouthwatering! As in! I should really try convincing him again! I should have gone with my friend when she invited me here to hang out. Didn’t know the place was really awesome. Maybe next time. 🙂 So besides the yummy foods and sight seeing, do you have other things you can do there? I’ve been there when I joined a Biker’s club two years ago. The place was really beautiful. And their minty lemonade is really a must-try! Ugghh why is Balamban so far far away. I wanna go there soon as well! Great post and photos! Ganahan ko mobalik didto Emjae! Nice kaayo sah? I’m planning to take my children to this place. How much is the entrance?